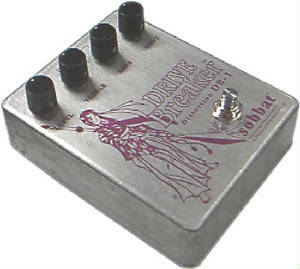 This distortion unit seems to have first been used during the ATYCLB sessions on the heavy distorted bits on "New York". I appears that it is also used on the outro solo bits of "Until The End Of The World" during the 2001 Elevation and 2005-2006 Vertigo tours. "The Edge walked in with that. It's a Japanese device. Edge, once in a while, would want a distortion twist, you know, and he will walk in with things and I get to walk in with things. But if you walk in with things [something] and Bono hears [it, he] goes "Oh my God, roll the tape!". And that's what happened. We used that on the solo on "Until The End Of The World". It's such an offensive little box that only works on a solo at the very end - it doesn't work all through a song."